Improved general performance when having a large number of files in the Tray folder. Fixed an issue causing some save games to return immediately to the map screen when attempting to enter a lot. Your paintings, photos and terrain paints will now persist when transferring from the Gallery. Addressed an issue that was affecting some players’ saves where restaurants / retail lots could not be open/closed by pressing the open/closed button. No more homey lot trait buff quickly cycling when performing related activities. Stats for an adopted Sim appear in their Simology Panel. If you don’t get caught, the stuff will now appear in your inventory. If you do get caught, do the right thing. Dance, dance to your heart’s content! But, when the music stops on the radio, so will your Sim. Call Jasmine. It’s ok. She will no longer knock endlessly. If you’re running Windows XP you can now use the Gallery again, but seriously, you should really consider upgrading. Food can be dragged into all worlds now. Dragged food… sounds yummy. The Police Chief is squeaky clean and is beyond reproach. He can no longer be a suspect in a crime. We have fixed the issue of babies getting stuck in apartments; stuck babies will be unstuck, and babies will hereby no longer get stuck again. We hope… for everyone’s sake. Going to a festival, but worried about gaining weight? No worries, Sims will no longer continuously order and eat food at the food stalls. If you’ve already packed on those pounds… exercise, exercise, exercise. More than one Sim in a household can now get festival whims when traveling to a festival, even if it has already begun. Ladies, outdoor bathrooms are now open. The Trophy of 73, which you can only get after winning 73 basketball competitions (there is really and truly no other way to get it), is no longer locked in Build Buy Mode. Keep at it, you might catch the elusive Pufferfish in San Myshuno. And now, all trait images will appear for a ghost who died by Pufferfish when you add the ghost to your household. Politics buff now has words. The best words. 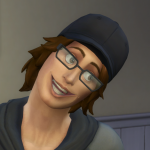 If your child Sim is nice, and plays well with others, the neighbor child Sim might come over to visit. Have no fear, you can ignore a neighbor’s complaint without affecting your relationship with your roomie. And, that’s not all… your Sim will listen to complaints and the interaction will not drop from the queue. Be good to each other folks!